Beautiful hand-crafted appreciation plaque is a wonderful way to thank volunteers and staff alike for their service. 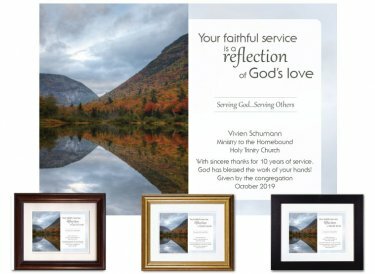 Reflections imagery beautifully illustrates the sentiment: Your faithful service is a reflection of God's love. You'll personalize this memento with the recipient's name, job title, and the name of your church or organization. Space is provided for you to add your own special sentiment. Original design. Hand-finished using premium archival materials. Additional designs based on the Reflections theme are available here and here. Framed & Finished - Printed on premium paper with archival inks and then double-matted with conservation-grade matboard as above; mounted using acid-free foam core backing; framed using distortion-free UV acrylic glazing. A protective dust cover and wall guards are applied to the back. Your choice of black, gold or walnut wood frame (view frames here); ready to hang. Finished size: 10"x12"